ECMS will be at the West Tech Career Day/Job Fair On Thursday, April 13! West Tech is coming up on another year-end graduation. Like in the past, prior to graduation, a career day/job fair is held for the students. This introduces them to the different Apprenticeship Program options that are available based on the career path they choose to take. 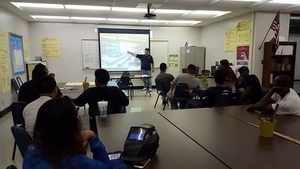 ECMS, who also provides a steel industry overview and corporate operations briefing to the upcoming welding graduates, will participate this year. We take pride in actively educating and employing local graduates.